Everyone’s talking “green for the holidays”. Okay, maybe you do want to make your garland out of bottle caps and things you have in the trash, but not everyone will. So we have a few ways to be holiday green without taking the holiday part out of it. According to the EPA, household waste increases 25 percent each year between Thanksgiving and New Years. That’s huge! We know you are already recycling, and in Seattle, composting your food scraps, right, so what else can you do? Here are 4 great ideas you might not have heard elsewhere. Have a Green Tree. Whatever holiday you celebrate, decorating a tree is or can be part of it. Buy a live tree with its roots intact, and replant it. If you replant your tree you can create years of carbon removal and habitat for nature’s creatures. A healthy tree can store up to 13 pounds of carbon annually. That’s just a little but it helps. And of course, a live tree will be less likely to catch fire. Don’t want to plant an extra tree in your yard? Check out the Trees for Salmon program at Swansons Nursery. You can buy a tree and bring it back after the holidays. The tree will be planted by volunteers where it will contribute to salmon habitat renewal. That’s super green! Be sure to keep the root ball cool, covered and watered, and get some care recommendations from the tree lot. Drink Green. We found a wonderful article about creating green cocktails. First consider choosing some organic mixers or depending on where you live, organic distilleries. There are also seasonal craft beers from green breweries such as Sierra Nevada, Full Sail Brewing (Oregon) Roots Organic (Portland) and Fish Brewing Company out ofOlympia,WA. Be sure to recycle all those empties. Clean green. Remember back when “green” meant “ineffective” at cleaning and you had to take that pink Castille biodegradable soap camping even though it smelled bad and didn’t clean. Things have changed. Grocery store brands now offer greener versions of highly effective products. Many people do heavy cleaning of the house before and after guests. Skip the sprays, try a reusable cloth vs paper towels and give that shelf of green products in the cleaning aisle a second look. Wrap Green. Many bloggers talk about using the newspaper to wrap gifts. I’m just not a fan. Wrapping paper is recyclable. The only exception: the shiny, metallic kind is not recyclable. Bows and ribbons are also not recyclable; consider saving these and reusing them instead. Try being green by using less wrapping paper. Your pets have no thumbs to upwrap paper – so save it and just give ‘em the bone or catnip. Let’s face it, they think every day they get fed is a holiday! Or, gift with re-usable decorative gift bags. Leave the attached tag blank and it can be re-used by the person you give it to. If you just want your tree to look stuffed with presents, buy pre-printed decorated boxes and reuse them every year instead of wrapping every little thing. But most of all, enjoy the holidays. Washington Energy Services will be here 24/7, even on Christmas, should you need help during the holidays including heating and plumbing emergency service. Call us at 800-398-4663. 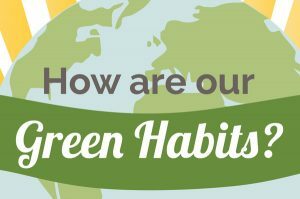 How are our green habits?